So! Listen to this crazy transportation ordeal! On the overnight bus from Hanoi to Ninh Bin our bus driver started smoking right under his No Smoking sign. Dee caught it immediately! She yelled from her front and center upper seat, "stop smoking!" And he froze as he tossed it out the window barely moving his arms to do so. Fast forward to 3 nights later. The 3 of us board the night bus in Ninh Bin to go to Hue and Dee says to me, I think that's the same driver! I looked at him and said no i don't think so, our guy was sconnier. Dee and I were about to step on the bus and grab seats for us while James loaded our luggage when we noticed... all the luggage being pulled out of the bus! 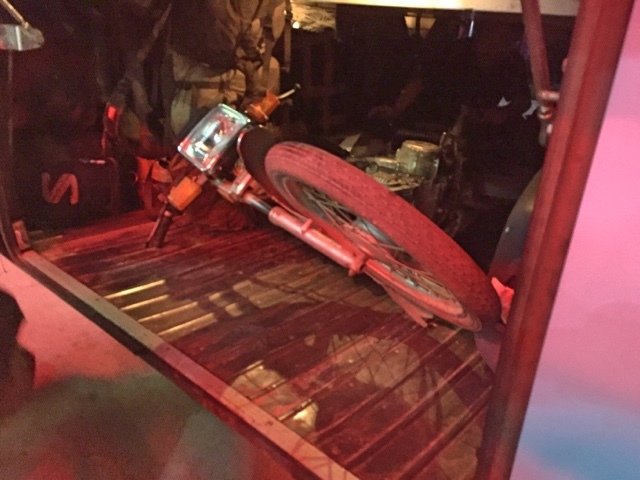 We watched 5 men grab a passenger's motorcycle and lay it on its side and push it into the luggage compartment of the bus. The look on Jame's face was priceless! True disbelief! And he was standing right next to the action! They loaded the backpacks back into the bus compartment, around and on top of the motorcycle. Now our bags will be smelling like oil and/ or gas. That's nice. Motorcycle! Just extra cargo. I just met 2 girls from Colorado that said their last bus had 5 motorcycles in it! What bags could no longer fit underneath were put on the bus in the aisle ways. Along with 3 or 4 people on the floor, in the aisle way. You are looking at the aisle way. Hard to believe since you can't see any walk way at all! The bus gets on its way and we are almost fully settled in. Dee and I are talking to a lovely young couple from Israel that are sitting in front of us. They are asking us how long we are traviling for and amazed by how the 3 of us are traveling for so long. Dee tells them her story on how she is able to travel the way she does and then she points to me. You want to know who has it figured out!? This girl! She works several part time jobs and when she's ready to leave on a trip she just goes. Doesn't have to quit a career or any of the part time jobs. She isn't tied down to anything. She's just got a really flexible schedule! Recently I've heard her and James say this to other travelers and I'm seriously shocked! It means so much to me to hear them say that! I look up to them as nomadic parents and I want to follow in their footsteps, I keep thinking of different ways to do so. Maybe I don't need to think anymore. Perhaps I'm already on the right path. Or so it seems! The girl from Israel and her husband also commented that I looked like Cameron Diaz! I haven't heard that since I left Australia in November. That was also good to hear considering the lack of workouts I'm getting and not as many healthy food options on the road. I guess I haven't gained as much food weight as I thought I had. I still have my movie star look! Ha! Ha! Yeah right! Dee has her eye mask on and earbuds in at this point and suddenly I smell smoke! WTH!? This is our new bus! This can't be happening again! I got up and made my way to the front, I reach the driver with of course, a lit cigarette in his hand and tap on his shoulder. When he looked at me I very sternly pointed to the No Smoking sign. He looked up at it, looked back at me and then back to the road. After a minute of me not budging, he shewed me away! What do you do in a moment like that, when you can't communicate in words and you're in his country? But there's no way in hell I'm going to put up with his little man attitude! I walked back to my seat but before hoisting myself up onto it I woke Dee up to tell her. As I'm telling her what just happened I feel 2 hands then 4 hands squeezing my calves! I look down and there's 2 Vietnamese ladies under Dee and my seats who are clearly fascinated with the size of my soccer player calve muscles! I started laughing and told Dee what was happening and she looked down at them and said (while motioning) "now look at this! Look at her arms!" Shey then proceeds to get me to take my sweatshirt off and flex for them! Then they older ladies start giggling and squeezing my arms. I had to pull away from them or they never would have stopped! We stopped for almost 45 minutes at one location in the middle of nowhere and James finally got up. 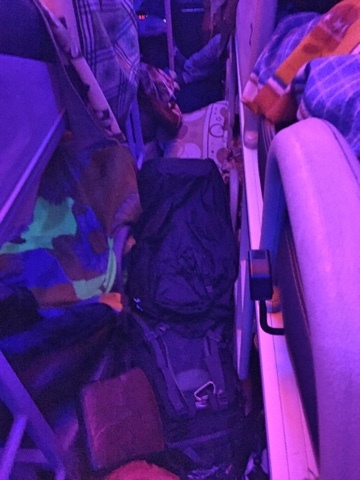 He wakes to the front of the bus and stuck his head out at the driver and his cohorts. They were smoking and as it looked, discussing how to fit more packages on the bus. James said to them, "what's the hold up?" No response. He then looks at one of them and says, "you spoke English when we got on the bus in NinhBin, I know you can understand me. Now I'm going to get us back on the road and drive the bus to Hue or you can!" Sure enough they got back on the bus and we drive off. 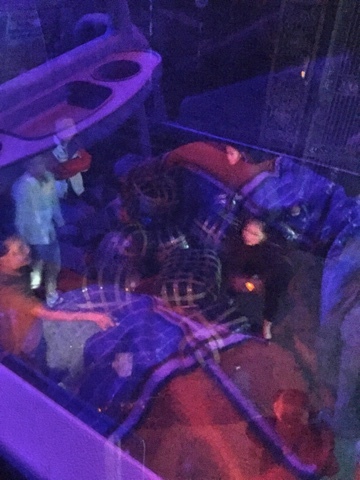 Blurry photo but this was taken from my window, looking down at the luggage area. You can probably see all the black plastic wrapped boxes with brown tape over them. Those are local packages that people are trying to fit on the bus for delivery. We were like a shady polar express bus! We truely were a delivery service bus not to mention a local Vietnamese transport service. We made countless extra stops to pick up and drop off local packages and people. So many that the bus to Hue was 2 hours late. The bus drivers charge for this service and the money goes straight to their pockets. When we arrived in Hue and we were getting off the bus, the driver tried to cut Dee off and get off before her. Big mistake! She grabbed him by the belt loop and shoulder and tossed him back in his seat. He looked shocked, as he should have been and then he said something in Vietnamese to her back. I gave him a good hard look that clearly told him I had her back. Obviously James Did as well even though he didn't see any of it happen. I didn't see him try to cut her off and it didn't matter to me, he deserved to be punched in the teeth as far as I was concerned! We got off the bus and he followed and made sure to stay at the other end of the bus from us. The Vietnamese people are generally very friendly people but there are definitely a few men who think they are entitled to things over us travelers and westerners. Well what I say to that is, we are generally bigger in size so please, don't mess with us is a rude manner! People like Dee and I WILL stand out ground. James will too when you mess with his lady! Have I told you lately how much I LOVE traviling with these two!? !